It was supposed to be another routine morning where we wake up early in the morning, go to our usual Malay stall and have our usual nasi lemak or nasi kerabu. We are however fast becoming bored with the usual kind of food we can eat in Lipis. Our choices limited largely due to the fact we have a malay colleague tagging along most of the time. Kuala Lipis is a small town, even if you combine the all the Taman Taman perumahans ( can count them all with fingers on one hand) and the actual Center of town itself. Luckilly for us, our colleague doesn't eat breakfast. So we are free to roam and eat whatever we want to . So we ventured off into the center of Kuala Lipis town. 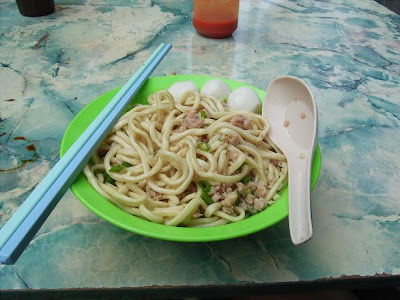 Where we heard (rumours-la) that in Kuala Lipis, one stall is very famous for their Hakka Mee. I am not very sure when was the last time I had hakka mee, or how is actually taste like. So off we went. So we parked out car, and walked to the Chinese Foodcourt Lane. Its a lane where you can find chinese hawker food in Kuala Lipis town. If you get lost, mmy directions for you is, stop at the Kuala Lipis train station and ask where you can find chinese food. 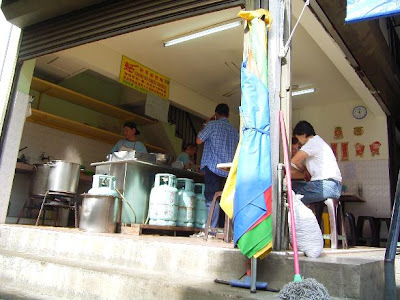 This lane is divided into two sections, this review is on the Hakka Mee stall, on the Upper Half section of this lane. There is another hakka mee stall in the lower half of this lane. 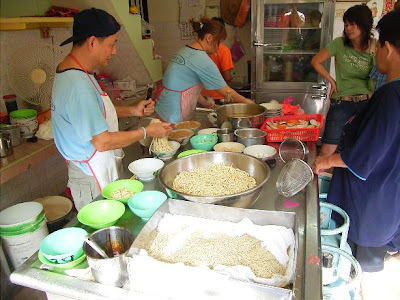 Ok, one look at the pic above, we could tell the noodles are home made. Personally for me, I don't like to eat mee, I am a mee hoon and kwai teo person. But this home made noodles are not yellow (means they din't put in any egg yolks, and it looks quite dry (still got flour wan) means not so oily. *light bulb* Healthy Noodles. So what is so nice about the noodles ? When the bowl first arrived on my table I thought they made a mistake. I asked for kon lou , means dry. My noodles were clear and drenched in half a bowl of soup. They put in lots of minced pork, 3 fish balls and a pinch of spring onions. The boss said, memang like that one hakka mee. If you want the dark noodles with dark sauce also can. Oh, if like that one , I will be very happy to try it. Frankly speaking, its not bad. No big deal. But the noodles feels nice when you bite into it. The soup is standard ching tong soup. The noodles.. wa, I can really go on and on and on about it. Some people might argue the best Hakka Mee is in Sarawak ( its like Kolo Mee ) or the best one is in Ipoh (everywhere u go u find hakka mee in ipoh). In Kuala Lipis they serve you a decent portion, the place looks clean, you won't get flys plunging into your noodles. The pricing is very decent also. I think it taste better.... but it is personal preference. I think I have had Sarawak Kolo Mee only twice before I started blogging. I think I had it once in Bintulu and once in Kuching which coincided with my arriving in Sarawak and leaving of Sarawak , ahahaha. But there are a lot of stalls in KL who claims to serve "Sarawak Kolo Mee", which IMO doesn't come close to what you really get in Sarawak.